Greetings Chic Alert readers! Like many of you, I’m a card-carrying shopaholic with the overstuffed closet of clothing, shoes and handbags to prove it. While I’ve indulged my inner diva by splurging on a few high-end designer labels over the years (either by saving up or by maxing out my credit cards at those designer fashion sales! ), most of my purchases are pretty strategic. I put my shopping dollars toward stylish, quality items that will amp up my wardrobe without breaking the bank. So it might come as a surprise that, among all of my skirts, sweaters, jeans and tees, there isn’t one single piece from Old Navy! Well, all that changed recently when I was asked to be part of the Old Navy Blogger Subscription Program. It’s pretty simple really. Once a month, Old Navy generously provides me with a $100 gift card to use at OldNavy.com or in an Old Navy retail store. In return, I share with you, all of the details about my Old Navy purchase and my overall shopping experience -- whether good or bad. Pretty cool, huh? Before I get to my pick, I have a confession to make. While almost all of my friends are Old Navy “regulars,” I’ve always walked past the store without the slightest desire to see what all the fuss is about. I suppose that my indifference had more to do with my pre-conceived notions about the quality than anything else. After all, with such low prices, surely Old Navy clothing won’t last more than a couple of day or night outs, right? 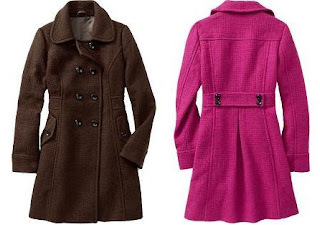 Always one to prefer one big purchase to a bevy of smaller ones, I spent my $100 Old Navy Gift Card on a single item – a classic Double-Breasted, Wool-Blend Coat (see pics below) that is as functional as it is fashionable and which will no doubt see me through several autumns to come. It's available in Brown, Infuschion, Black and Cream. Sure, I could have gotten a couple of sweaters and leggings for the same price, but I don’t regret my decision one bit. This Old Navy coat is gorgeous!! For starters, the double-breasted style is absolutely timeless while the slightly darted waist gives it an ultra-feminine silhouette. The back-waist belt accentuates an hourglass figure even further, giving this coat a “twirl-worthy” feel. On the practical side though, the big selling point for me was the deep button side-flap pockets! They’ll provide plenty of room for my gloves without looking the least bit bulky. I’ve amassed quite a collection of coats and jackets through the years, and have never understood why more designers don’t include pockets! The classic spread collar is also perfect for transitional fall-to-winter dressing since it can be worn with or without a scarf. Oh, and did I mention that this luxe looking coat is fully lined? I purchased a Size Small and would say that it runs true to size. If you purchase your regular size, you should be able to wear it over both suiting and relatively thick sweaters without feeling constricted. I’m almost 5’5”, and this Old Navy coat falls just above my knee, making it the perfect topper for this season’s over-the-knee boots. I also have very long arms, and was thrilled that the sleeves fall below my wrist as they should (too-short sleeves are a pet peeve of mine). At $89.50 US plus tax, my first-ever Old Navy purchase looks and feels far more expensive than it is. This classy Old Navy coat will be an excellent addition to your autumn wardrobe. Keep in mind that, unless you live in an especially warm area of the country, it probably won’t be thick enough to take you through winter. However, I saw plenty of heavier options that will see you through those dreaded frigid temperatures in style. To say that my first-ever Old Navy shopping experience was a pleasant surprise would be an understatement. Aware of the brand’s popularity among “tweens” and teenagers, I had always assumed that Old Navy would have little to offer my demographic: the young professional who is looking for style and quality at an affordable price. Well, I couldn’t have been more wrong! This was my first Old Navy experience, but it certainly won’t be my last. If you’re a professional, style-savvy woman in your 20s or 30s, I’d highly recommend a trip to Old Navy if you haven’t made one already! And before I forget, the staff at my local Old Navy store were fantastic – very helpful, but not at all pushy. My sales associate advised me of all of the current sales and was highly knowledgeable about the company and the products. As a fun aside, she even knew about the recent paparazzi shots of Cavallari and McCord in Old Navy, adding that Eva Longoria Parker (see Eva Longoria Parker in Old Navy: Fashion Designers InStyle) and Gossip Girl’s Chace Crawford have been spotted in Old Navy as well! Old Navy has definitely found a new fan in this fashionista! I can’t wait to come back next month with my new Old Navy picks. Until then, I’d love to hear your thoughts on fashion shopping at Old Navy and on this season’s Old Navy pieces. Have you purchased any Old Navy Fall or Winter clothing yet? What about footwear or accessories? This Old Navy newbie is looking for recommendations! Disclaimer: The opinions expressed in this post are purely my own and were not in any way influenced by Old Navy, the exclusive Old Navy Blogger Subscription Program or Old Navy's PR agency and the $100 gift card that they provided.